Hold your breath, this recipe requires 50 cloves of garlic. 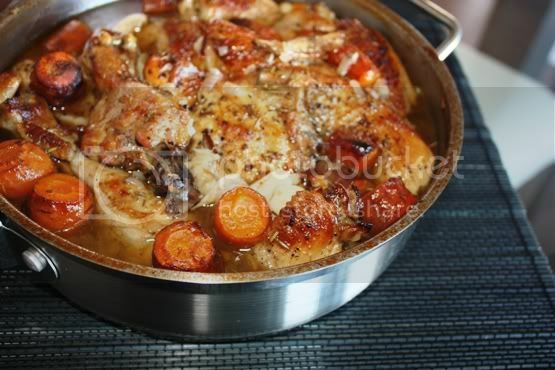 This is a very Portuguese-inspired meal where the food is braised to cook with simple supplemental flavorings. I know you probably think that 50 cloves of garlic seem like an overkill but trust me, it is lovely. The garlic flavor was just right, and not overpowering at all. Actually, cooked garlic has a very sweet and mellow flavor and in this dish, it’s really an ode to the garlic. I figured that with the season changing and a piggy bug going around the globe, a little boost to the immune system with some garlicky goodness will do everyone some good. Garlic is high in antioxidants and has natural anti-viral properties that helps us ward off the nasty cold and flu. So, before I digress further into a health charade, this chicken recipe was taken from Epicurious. I made a little tweak to it by adding a bit of shallots, carrots and instead of fresh thyme, I used what I had; some dried rosemary. It was delicious and simple to make. And it is a crowd-pleaser recipe that I think you ought to give it a try. 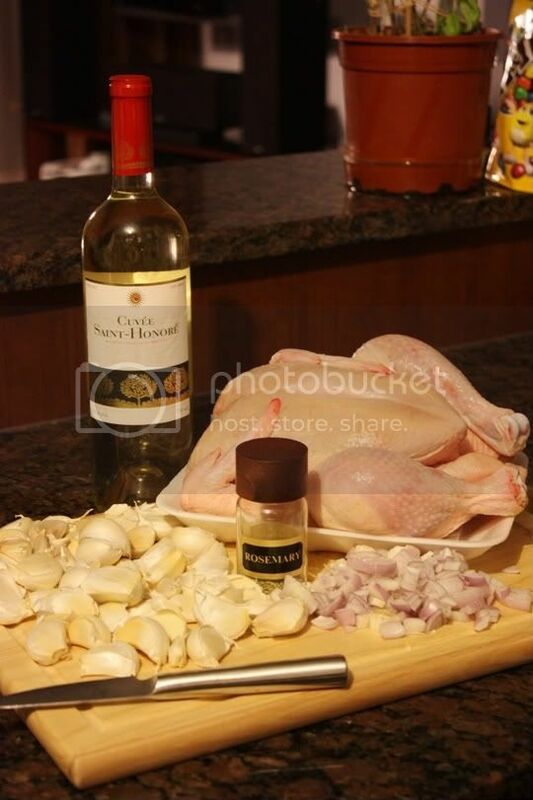 Here’s the recipe for Chicken Braised with Garlic and White Wine. 1. Season your chicken pieces with salt and pepper, generously. 2. 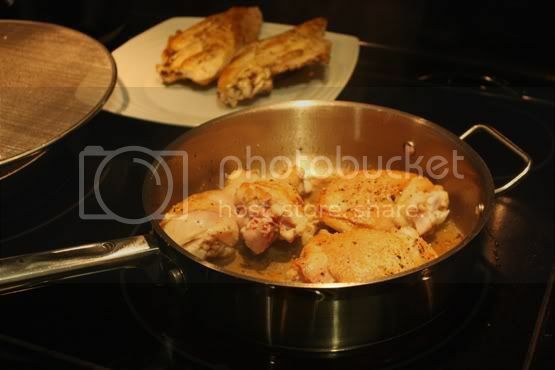 Heat a large lidded pan with 2 tablespoon of olive oil and sear your chicken pieces until they are browned on all sides. This browning stage is rather important because it gives a lot of flavor. 3. 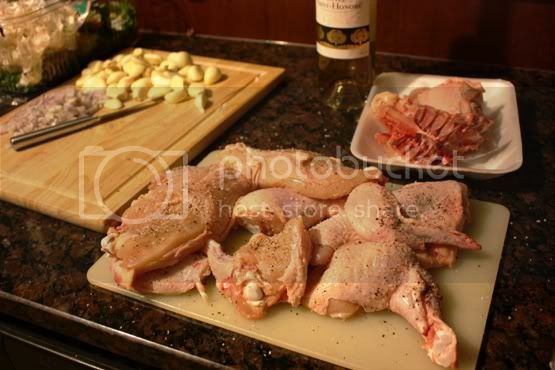 After all your chicken pieces are browned, set them aside and in the same pan add the remaining 2tablespoons of olive oil and throw in your garlic cloves, saute them for a minute on low heat until they are slightly browned. Add your minced shallots in for a saute until they become translucent. 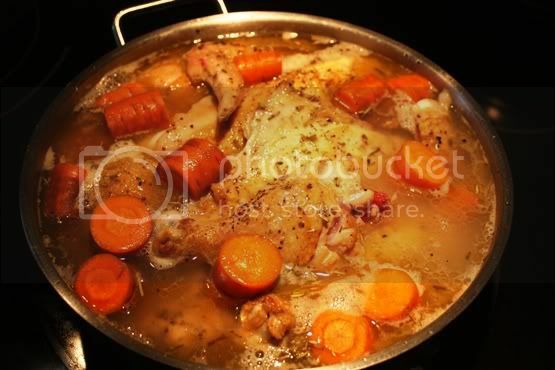 Oh those 50 cloves of garlic is in there, under the chickies releasing all it’s garlicky goodness. 4. Add the 2 cups of white wine in, and let the liquid come to a simmer. 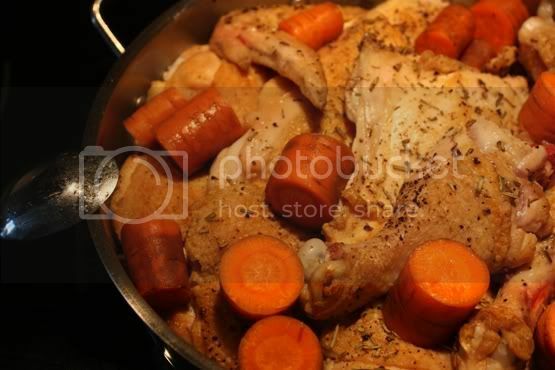 Transfer the chicken back into the pan, throw in the rosemary and carrots. 5. At this point, you have the option to finish the cooking on stove top or in the oven. I popped it in a 350F oven for another 45minutes covered and then another 15 minutes uncovered and i increased the heat to 450F. If you want to cook it on the stove top, cook it covered under low heat for 1 hour. To serve, I made some greens and mash potatoes to go with it. 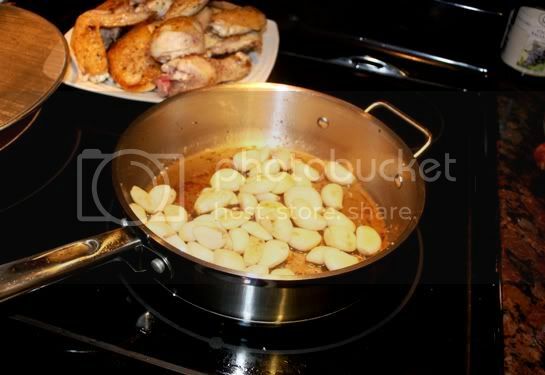 Spoon the chicken and garlic pieces over the mash potatoes. Here’s to all it’s garlicky goodness!